A diverse set of radio production mechanisms makes the radio wavelengths a unique observational window into the universe. Radio emission can be produced by both quiescent and eruptive phenomena, e.g. flares and coronal mass ejections (CMEs). The morphology of the quiet Sun in radio depends on macroscopic MHD quantities, such as the density, the temperature and the magnetic field, and the type of the emission. Lee at al. (2009) showed that higher radio frequencies can probe stronger magnetic fields, as they penetrate deeper into solar atmospheric layers. While there is a plethora of quiet Sun observations, observing radio loud CMEs is a rather difficult task as they become diffuse soon after the eruption. Only a handful of CMEs have been observed in low radio frequencies and only at the early stages of their evolution, e.g. Zucca et al. (2018). 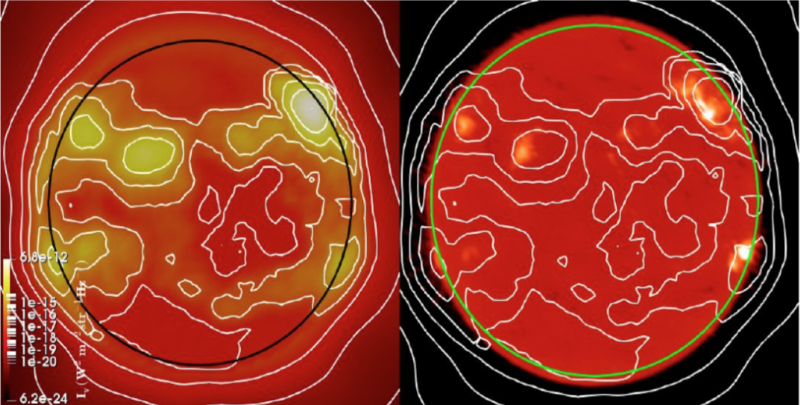 We developed and included in our wind and coronal simulations a radio synthetic imaging capability, which computes the radio intensity of a specific radio emission mechanism along the curved ray paths. We present the first results with this ray-tracing algorithm and compare them with solar low and high frequency observations. Figure 1. Left: Synthesized Bremsstrahlung radiation as captured in our simulation at 17 GHz for CR2107 (centered at March 7, 2011). Right: March 7, 2011 Observations from Nobeyama at 17GHz with the overplotted contours corresponding to the simulation. Our simulations are performed with the state-of-the-art code BATS-R-US van der Holst et al (2014), which provides a realistic description of the solar corona, wind and CMEs, calculating the plasma and magnetic field conditions in a time-dependent manner. For the radio synthetic images we implemented in BATS-R-US a ray tracing algorithm based on Benkevitch et al. (2010), which calculates the actual radio ray trajectories in space plasmas with well determined MHD plasma characteristics. For this study we focus on Bremsstrahlung emission, due to its dependance on the density and temperature which are provided by our MHD simulation. The solar corona is a highly non-uniform medium, which means that the refractive index is a strongly spatially varying quantity between media of different densities. For that reason the role of refraction is critical for locating in 3D space the locations and origins of different radio sources. Specifically, for each radio frequency there is a critical surface below which the ray cannot penetrate and which defines a magnified size of the solar surface. This is a well known property of radio observations. We have validated and tested our algorithm by running a simulation for a dipolar solar magnetic field and recovering the expected radio flux as a function of frequency for the quiescent Sun (Zarka 2007). Time-averaged over a solar rotation (synoptic) photospheric magnetic fields are used to drive our simulations. In this study, we simulated the quiet Sun during Carrington Rotation (CR) 2107. In Figure 1 we show the synthesized (left) and the Nobeyama Radioheliograph observed radio emission at 17 GHz. Our results are in good agreement with the observations. We also simulated the CME event that took place on 7 March 2011 at 19:40. Figure 2 shows synthetic radio images of that event in 6 different frequencies. The results demonstrate that refraction is playing an important role with rays of higher frequencies probing stronger magnetic fields in active regions as they penetrate in layers closer to the photosphere. With increasing frequency the total radio flux is gradually dominated by the active regions, with the transition happening around the GHz frequencies. The CME morphology captured is in good qualitative agreement with the CME observed by Bastian et al. (2001). The dominant emission of that event was attributed to synchrotron emission, which is not accounted for here. However, the synchrotron emission strongly depends on the magnetic field, which is computed by our 3D MHD simulation in a self-consistent manner. We have incorporated a synthetic radio capability in state-of-the-art 3D MHD solar corona simulations. The main focus of this study is the Bremsstrahlung emission, which depends on the density squared ($\rho^2$), similar to EUV and X-ray line dominated emission. The radio intensity of the Bremsstrahlung emission is computed along curved ray paths accounting for refraction. 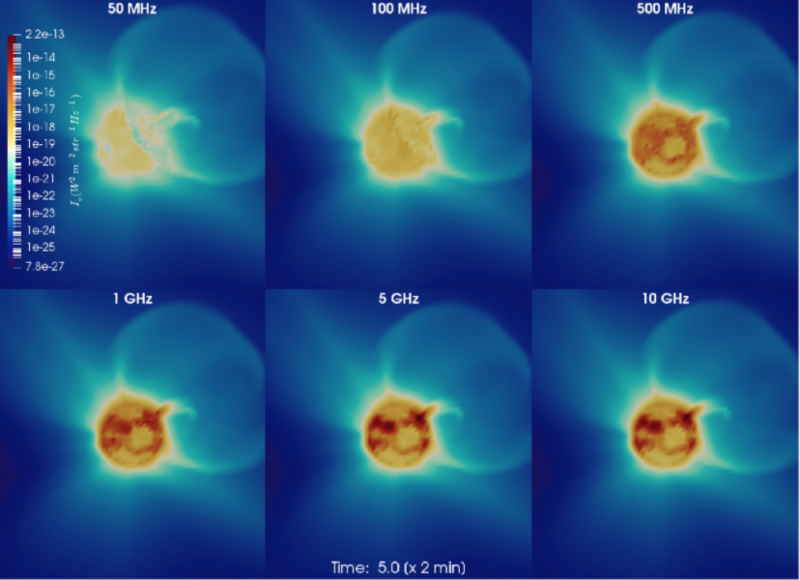 Our simulations captured the radio counterpart of EUV waves propagating toward the Sun due to the CME exhaust. This is the first time that refraction has been accounted for so systematically in a realistic solar corona through forward modeling in 3D. This ray-tracing algorithm can provide guidance for the next generation radio missions. In the future, we plan to account for scattering, and include non thermal radio emission processes in our simulations in order to study the evolution of radio bursts. Recently, Cohen et al. (2018) used this algorithm to predict the detectability of exoplanets by quantifying the modulation of the stellar radio mission by an exoplanetary magnetosphere through a transit.